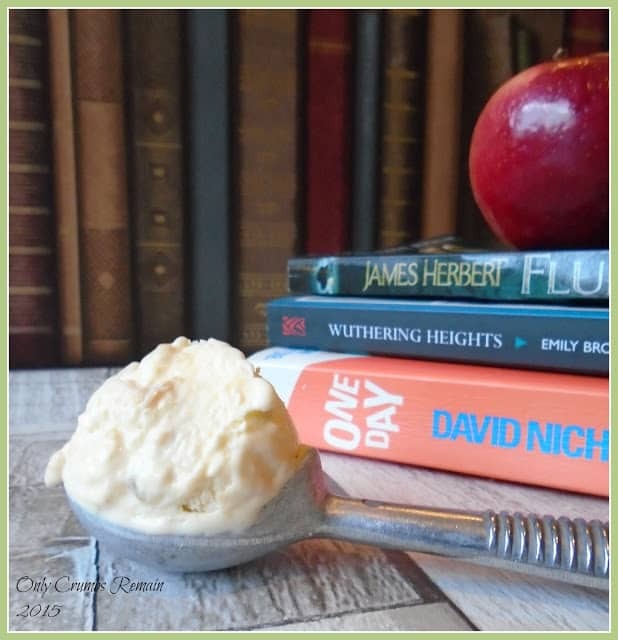 Inspired by the classic apple crumble and custard, this ice cream is incredibly delicious having been made with a custard based ice cream with caramelisd apple pieces and crumble! I just adore apple crumble and custard. It’s simple, unpretentious and comforting. Just like a great big hug in a bowl! Mmm. When apple crumble is married with ice cream, Oh. My. Goodness. It’s delicious. It’s irresistible. It’s a wonder there’s any left for Mr E to try it tasted so good! You know when you’re baking and enjoying the chef’s perks of tasting as you bake, well I have to admit there was a little too much of that going on! 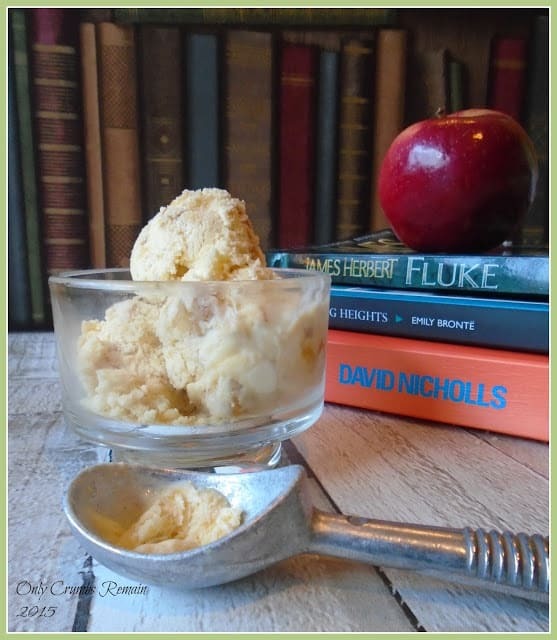 I realise it’s not exactly ice cream weather being October, but it’s still quite mild out and I’m sure you’re going to love the combination of apple crumble and custard made as an ice cream as much as I did. There’s the creaminess from the custard, a slight tartness coming from the apples, a sweetness from the toffee sauce and texture from the crumble, all in an ice cream! I ask you, what’s not to like! The ice cream base was made with custard and was chilled before being churned in the ice cream maker. Once it reached soft scoop stage (you know, like Mr Whippy), I then rippled in the apple which had been cooked in a toffee sauce, and the crumble pieces. As the ice cream would need to go into the freezer to firm up a little more, I added some liquid glucose to the apple & toffee sauce mixture to help prevent the formation of ice crystals. Some of the toffee sauce and crumble was held back to drizzle and scatter over the ice cream. So, let’s get to it and bake! 1. Prepare your ice cream maker. Depending upon the type of ice cream maker you have, you may need to place the inner drum of the machine into the freezer the day before the ice cream is required. Follow your manufacturer’s instructions. 2. Make the custard. Pour the milk and cream into a heavy based pan and slowly bring to the boil. Meanwhile, place the egg yolks into a good size bowl and whisk together with the sugar. Once the milk / cream has almost come to the boil pour half of the liquid over the egg mixture whilst whisking all of the time. Pour the egg mixture back into the pan and continue whisking. Place the pan on a very low heat to allow the eggs to cook without scrambling. Using a wooden spoon, constantly stir the mixture. It will gradually start to thicken. Remove the wooden spoon from the pan and run your finger in a straight line on the back of the spoon through the custard. If the mixture doesn’t run into the tracing the custard is ready. Pour into a Pyrex jug (or similar) and cover with cling film, ensuring the cling film is in direct contact with the surface of the custard. Set aside and once cool place in the fridge to chill. 3. Preheat the oven to 180 c / 160 Fan / Gas 4. Base line a baking tray with greaseproof paper, tacking down the corners with a little margarine / butter. 4. Make the crumble. Place the flour and chilled diced butter into a bowl. Rub the mixture between your thumb and finger tips until it resembles bread crumbs. Stir in the sugar and oats. Pour the crumble mixture onto the prepared baking tray and spread it out. Place in the oven and bake for 10 – 12 minutes. After 8 minutes fork through the mixture and return to the oven for a few more minutes. Once cooked, remove from the oven and pour into a bowl and set aside. 5. Make the apple and toffee sauce. Peel, core and dice the apples into cubes about 1.5 – 2cm. Cover the apples. Place the butter into a heavy based frying pan or pan, set it over a medium heat and allow to melt gently. Add the sugar, allowing it to dissolve into the melted butter. Eventually the mixture will become a fairly dark brown toffee like colour. Add the apples and liquid glucose and mix. Cook the apples for about 4 – 5 minutes. They need to be cooked through but not breaking down. Remove from the heat and pour into a bowl to cool. Remember, the toffee sauce is very hot. 6. Make the ice cream. Once the custard is cold and toffee-apple sauce has cooled, set up your ice cream maker. Turn the machine on and pour the custard into it. Churn the ice cream until it reaches soft ‘Mr Whippy’ stage, the time duration for this will depend on each machine but as a guide ours took about 25 minutes. Using a spatula tip the ice cream into a plastic freezer safe oblong container. 7. Flavour the ice cream. Tip half of the crumble into the ice cream and mix gently. Add two thirds of the toffee-apple mixture to the ice cream and mix lightly to ripple it through. Replace the lid and freeze the ice cream for about 2 -3 hours to firm up. Enjoy scattered with a little of the remaining crumble and toffee sauce! Thankyou Gillians, it was really very scrummy! 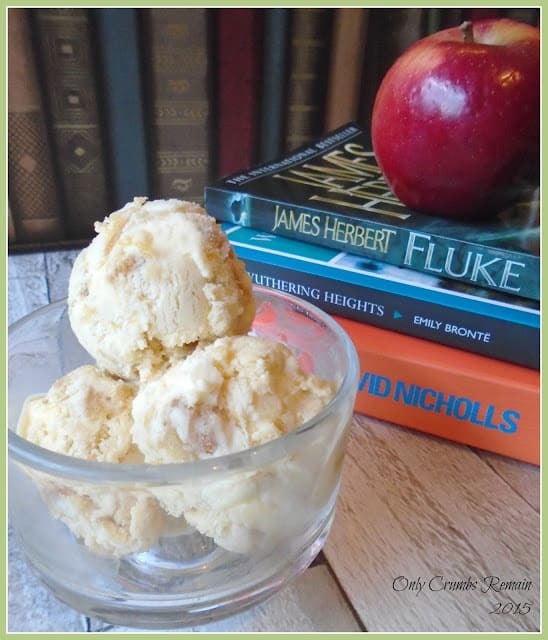 Apple Crumble is just the bee's knees isn't it – amazing flavours and when I tried it in this ice cream I was completely blown away by how good it was. I was very pleasantly surprised by how delicious the ice cream was. It certainly didn't last long 😉 That's certainly good to know that ready made custard does work as an ice cream base. Wow, this looks so delicious! And what a fabulous idea to have the apple & ice cream combined into one tasty dessert. Good tips to use shop bought ingredients as a short cut too for those less adventurous. Thanks so much for linking up with #foodpornthursdays. Such a great idea! A great mix of two of my favourite foods! Hahaha 🙂 I'd have sent you some Kirsty but we devoured it very quickly! It was incredibly delicious – actually exceeding my expectations! 🙂 Thank you Steph, we REALLY enjoyed it! If you try it, let me know how you got on with it. I'm off to google Apple Pie a la Mode now – there's something in the back of my mind saying that I've heard of it before but can't quite place it. It really is very yummy Madeline 🙂 Yes, that's a much easier way to do it – especially if you have a favourite brand. Thanks Sarah. There must be some science behind the liquid glucose preventing ice crystals forming – though I've no idea what it is! All I know is that it certainly works!